“Shukran jazeelan” is “Thanks a tonne” in Arabic (actually, it’s more like this: شكرا للطن). 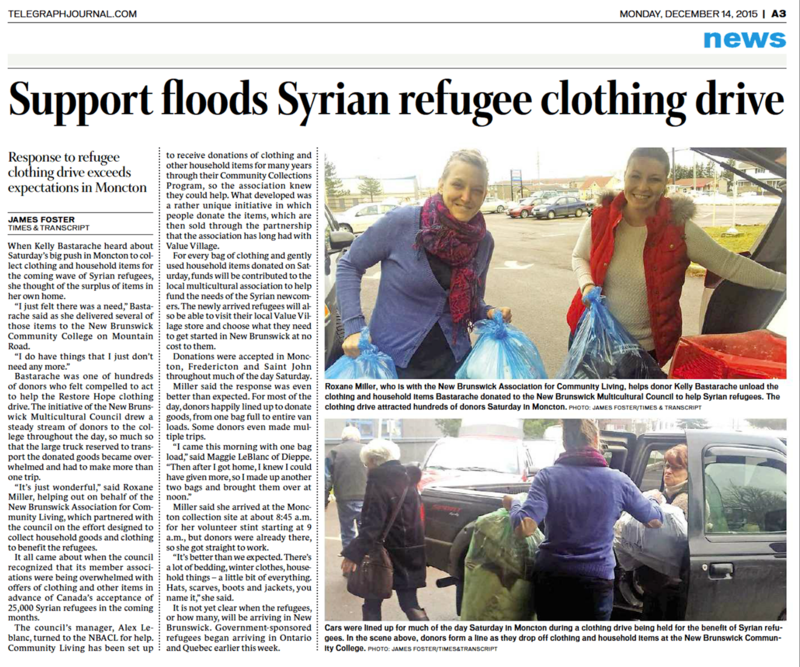 And that’s what we want to say to the hundreds of folks who turned out in Fredericton, Moncton and Saint John on Saturday, December 12 for our clothing drive in support of our soon-to-be-here Syrian newcomers. You donated, well, tonnes of clothing, linens, footwear, toys, small household items and more! Even hockey sticks! How Canadian is that, eh! The way everyone gave on Saturday, the smiles on your faces, and on the faces of those working to keep track of all the goods coming in . . . that said it all. It was no less than what we expected from our fellow New Brunswickers, but it still was really magical! So now the work begins, as all those donations are counted, sorted and sized and we prepare for our newcomers’ arrival within the next couple of months. It sure feels good to have helped them feel welcome! Your help has been huge! Your quick response has gone a long way in helping three of the organizations handling refugee intake — the Multicultural Association of Fredericton, the Multicultural Association of Greater Moncton and the Saint John Y’s Newcomer Connections program — as they prepare for our new New Brunswickers’ arrival. Not only that, but you’ve also supported people here in this province who have an intellectual disability, since the proceeds of this drive are being shared between the multicultural groups and the New Brunswick Association for Community Living (NBACL). Folks in Fredericton who want to give can drop their donations off at the NBACL offices, 800 Hanwell Road, during regular office hours, 8:30 am to 4:30 pm, Monday to Friday. 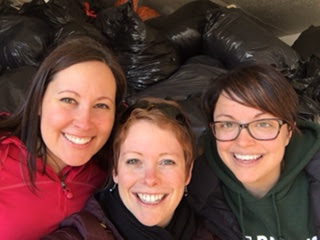 For those in Moncton, please call our office at 1-866-622-2548, Option 1 to arrange a pick-up or drop your bags, marked with an S, into one of our BOBs (big orange donation bins). Saint Johners can also call our office for a pick-up (1-866-622-2548, Option 1), or they can drop their donations off at our Community Collection office in the Blair Building, 156 Westmoreland Drive (we’re in Suite 301, but donations can be left by the door). Our office hours there are 9 am to 9 pm, Monday to Friday. Once again, Thank You! Merci! Shukran!